Analysis: Maryanne Trump Barry, an inactive federal judge, is mentioned throughout the report, which uncovered questionable tax schemes. One Trump family member should be particularly concerned about the possibility of impeachment as a result of the revelations. And it's not the president. 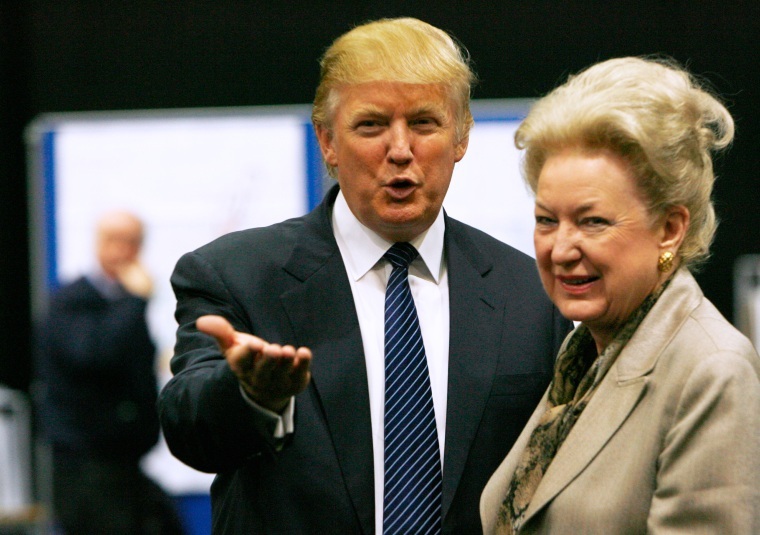 Maryanne Trump Barry, 81, the sister of President Donald Trump, is a senior judge on the U.S. Court of Appeals for the 3rd Circuit, based in Philadelphia, though she does not actively hear cases any longer. Barry is mentioned throughout the newspaper's investigation, which says Fred Trump "often" consulted with his then-federal judge daughter on legal matters. It also describes her as present at 2003 meetings at Trump Tower "for one of their periodic updates on their inherited empire" with the siblings and Allen Weisselberg, the Trump Organization's chief financial officer (who was recently granted immunity by federal authorities). The Times report found that Donald Trump "and his siblings set up a sham corporation to disguise millions of dollars in gifts from their parents, records and interviews show," and that properties were transferred to him and his siblings using questionable tax planning. The Times doesn't specify which of the siblings set up the "sham corporation," but it appears from the investigation that all siblings, including Barry, at least benefited from the dubious tax and transfer practices. Beyond the question of whether Judge Barry knowingly participated in an attempt to defraud the U.S. government of tax revenue, the report alleges specifically that Barry offered legal advice to her father. According to the Code of Conduct for federal judges: "A judge should not practice law and should not serve as a family member's lawyer in any forum. A judge may, however … without compensation, give legal advice to … a member of the judge's family." The question is: Was that advice "without compensation"? That would require a careful analysis of the tax and business records. If she were actively involved at business meetings, it might tend to suggest that there was compensation. It's not clear, however, whether an inactive judge can be impeached. In June 2011, Barry took senior status, a form of semi-retirement that still allows judges to hear and rule on cases. She then moved to inactive senior judge status in 2017, and does not appear on the court's online roster of judges. Inactive senior status means that a judge retains judicial authority and can return to active senior status, though they do not hear cases. It may be the case that inactive senior status means a judge has already "left" the bench. But if it does not, impeachment remains a possible threat to any federal judge. Of the 19 impeachments in our country's history, the vast majority — 15 — have been of federal judges. Robert Archbald, also a 3rd Circuit Court of Appeals judge, was impeached in 1912 on charges of improper business relationships with litigants. He was convicted by the Senate and removed from office in 1913. Halsted Ritter, a U.S. District Court judge for the Southern District of Florida, was removed from the bench by impeachment and conviction in 1936 on charges that included practicing law while sitting as a judge. Harry Claiborne, U.S. District Court for the District of Nevada, was removed in 1986 on charges that included income tax evasion. It makes sense that we most often target judges for impeachment; unlike other officials, they serve for life, and cannot be removed in the next election cycle. But there is little concrete guidance on what is an impeachable offense for a judge. With Barry, the situation is not clear — including an important preliminary issue: Whether a senior, inactive judge is even still a "judge" for purposes of impeachment.